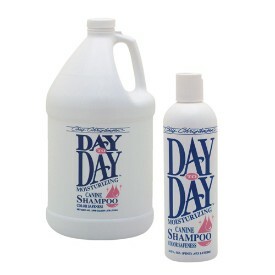 Create a truly comforting spa experience for your pet when you use this gentle conditioning and deodorizing shampoo. 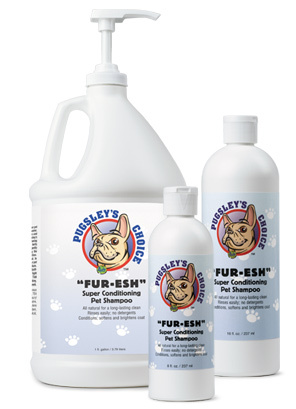 Fur-esh softens and adds shine to fur for a long-lasting clean that repels dirt and odors. Fur-esh rinses cleaner with no residue and contains no harsh detergents that can irritate the eyes and dry the skin. Its a fresher, brighter clean that is safe, even for nursing pets. a pleasure for you and your dog. Specifically designed for whites, creams, pale golds and light silvers. Made from a new state-of-the-art enzyme product which is not only safe but also a very effective stain remover and brightener, we have included hair strengthening and conditioning ingredients, to protect the coat. Pure White Lightening Shampoo may also be used on parti-colored dogs however it should not be left on colored parts any more than 2 minutes as it can remove color. 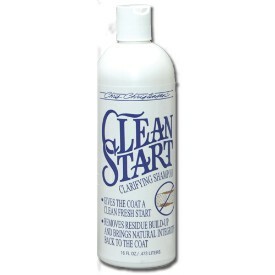 For best results clean the coat first with one of your favorite # 1 All Systems shampoos to remove excess dirt and oil. Apply Pure White Lightening Shampoo full strength to the coat, work into the coat completely and leave on for a minimum of 3 minutes before rinsing thoroughly. Depending on degree of whitening desired or needed and amount of time left in the coat this will effect ultimate results. A super Cleaning shampoo, which helps remove even the toughest stains and odors, it contains optical brighteners which enhance the dog�s natural color, it is safe for all colors but is highly recommended for whites, blacks, silvers, creams. Professional Formula Whitening Shampoo contains all natural, healthy ingredients, and contains no peroxide, bleach, silicone or blueing products which adversely affect skin and hair. 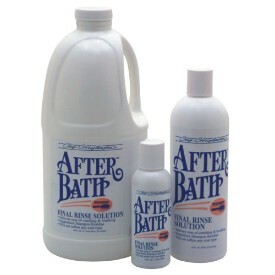 The perfect shampoo for touch-ups, when a complete bath is not practical or necessary. 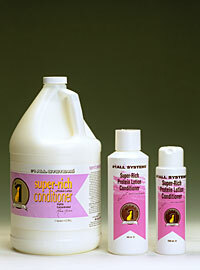 Self Rinse Conditioning Shampoo will clean, condition and deodorize, all in one step. The natural coat texture is maintained and buildup is non-existent. This is a concentrate with a light refreshing lemon lime fragrance. An all natural Conditioner formulated with pure vegetable protein, herbs and natural ginger scent for all types of coat. Super Rich Protein Lotion Conditioner will help detangle, is an excellent anti-stat, keeps the coat looking and smelling better longer, also a super concentrate. Recommended for builking body, and for harder textured coats. 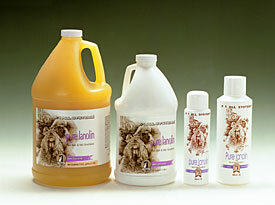 - Lanolin Oil - 40 to 1Concentrate - Formulated for dogs. Lanolin is the only oil which can be naturally absorbed into the skin and hair. It improves the elasticity and moisture level on the skin and coat. On the longer coats it should be mixed with the Protein Lotion Conditioner and used to hold and protect the coats between show. Pure Lanolin Plus is recommended that amounts be adjusted according to individual coat needs and amount of time between groomings. After applying as evenly as possible, rinse coat thoroughly, the rinsing will not rinse the product out but will help to ensure even distribution. This is especially critical on the double coated breeds. The Lanolin is not water soluble, so the rinsing will not rinse the product out. It either has to be absorbed or shampooed out. 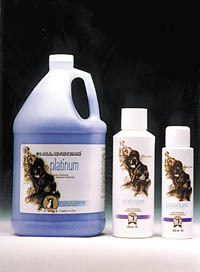 Pure Lanolin Plus can also be used straight on the short coated breeds such as Labs, Rottweilers, Dobermans, Beagles. We recommend applying the product after the dog is freshly bathed and working it into the coat with either our unique massage brush or a rubber brush, and then wipe away the excess. 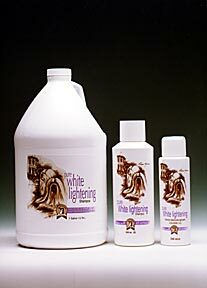 for pale gold, white, cream & light silver coats) - Formulated for dogs and cats. A safe, gentle baby shampoo based fomulation containing natural pyrethrins. 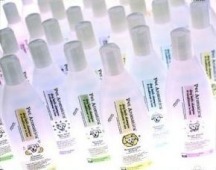 Rich in conditioners and highly effective against fleas, tick and lice. 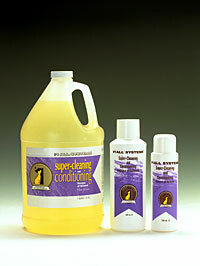 For a sparkling clean, residue-free coat follow with All Systems Super Cleaning and Conditioning Shampoo. Ear So Fresh keeps ears clean, fresh and reduces ear wax buildup. This natural herbal wash for dogs and cats is an effective, soothing blend of full strength herbal oils and extracts that is free of artificial chemicals, coloring agents and preservatives. Evaporates naturally for the ultimate in ear hygiene. #1 All Systems Fabulous Grooming Spray is formulated from all natural ingredients and contains a lipid layer enhancer which deposits lipids on the skin. Dramatically increases softness, smoothness and moisturization of the skin in 3-7 days. The coat is coated by lipids and conditioners that protect the hair chemically and physically. This same ingredient also prevents matting, tangling, static and splitting even if the hair gets wet after the spray has been applied. #1 All Systems Fabulous Grooming Spray physically coats the hair with a state-of-the-art conditioner that has a positive charge to repel dirt which is negatively charged. With continued use of this fabulous grooming spray, coats improve in condition, texture and volume, combability and gloss. Gets the red out! 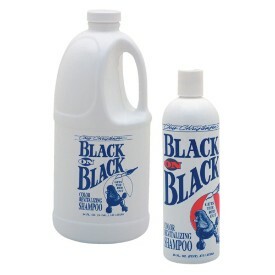 Black on Black is an optic intensifying, high sheen color-revitalizing treatment within a shampoo. Formulated specifically for use on black coated dogs, it restores the intense black color of coats exposed to the bleaching effects of the sun. Removes wax, oils, resins, and build-up that weigh down the coat, giving it a fresh, healthy look. Enriched Pro-Vitamin formula allows deep cleansing without stripping the coat of its essential oils. 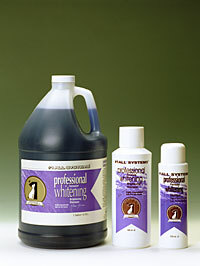 Prevents off-casts and problems that impede the coat's natural shine, health and vitality. Good for all coat types. This superb cleansing formula meets the needs of all skin & coat types on both canines and felines. Enriched with Vitamin E, Colloidal Oatmeal and natural botanical extracts to gently clean and restore natural moisture. Mild enough to use everyday, natural conditioners add body and sheen. 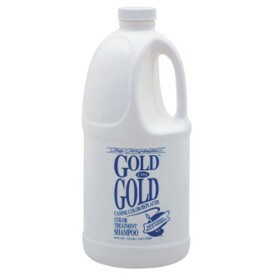 Treatment within a shampoo enriches gold color tones. Also works beautifully on dark multi-colored breeds such as German Shepherds and Belgian Tervurens, intensifying the gold undercoat gives the appearance of depth and fullness. Gets the yellow out! 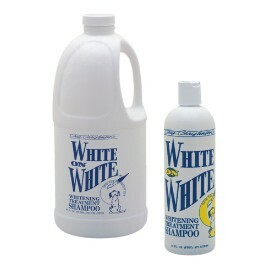 Unlike other whitening shampoos, White on White can be used on all coat colors! This product is an optic intensifying treatment within a shampoo, removing all yellow stains with a lustrous sheen on darker colors. Contains NO bleaching agents, harsh chemicals or softening agents. Flushes out any shampoo residue. Adds manageability, moisture and comb ease with zero weight to the most delicate coats. 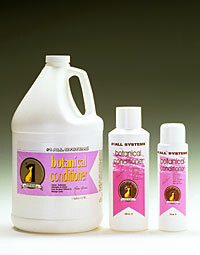 Recommended for all coat types, particularly those that fall when using heavy conditioners. Seals the cuticle, adds resilience and moisture without any traces of heavy waxes or oils. Delivers outstanding ease of combing and brushing the coat, cutting drying time. Leave in conditioning, finishing spray and detangler with SUNSCREEN! 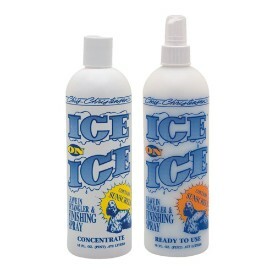 Ice on Ice treats, fortifies and protects the coat, creating a protective barrier that locks in moisture. 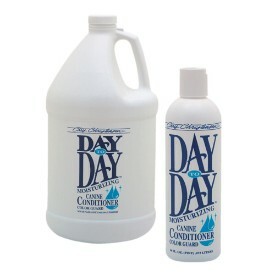 Repels dirt, dust, urine and pollutants that damage and break the coat. Adds elasticity and strength to prevent breakage when brushing. 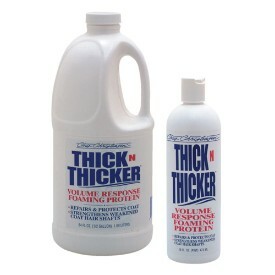 Thick N Thicker Volume Response Foaming Protein adds astonishing volume to any coat type. Replenishes protein and creates volume by implanting a high volume of low molecular weight proteins. The dense compact foam base allows easy distribution through the coat. Naturally volumizes thin, skimpy coats while repairing and protecting coat hairs. Strengthens weakened hair shafts and repairs split ends. Natural, botanical ingredients lock in moisture for dry, damaged coat and skin. Unique, oil-free moisturizing agents soothe and condition for a shiny and more manageable coat. Eliminate static, fly away and frizz! Gives a smooth and silky texture with a glossy shine. Transforms damaged skin and coat with moisturizing liquid silk protein. Pet Aromatics 12 oz. Dog Bath Shampoo/Conditioner in 1. It contains no harsh chemicals, is alcohol free, detergent free, pesticide and phosphate free. We use only vegetable based cleansers and natural conditioners such as aloe Vera, chamomile, oat flour protein and macadamia and almond oil. Woodsy Woof is scented with eucalyptus which is a natural insect repellent, lavender which helps relieve itching and fir needle which acts as a natural deodorizer. All our products come with a 100% guarantee - you and your pets will love them!